A good clean cutting action works for many things. Hold the front handle of the saw with your gloved left hand with your thumb wrapped tightly underneath. Grab the rear handle with your gloved right hand. Get into sawing position by spreading your legs apart for stability. Now pull back the chain brake to disengage it. Then squeeze the throttle. The saw cuts best when the engine is at full throttle. Pretty simple eh? 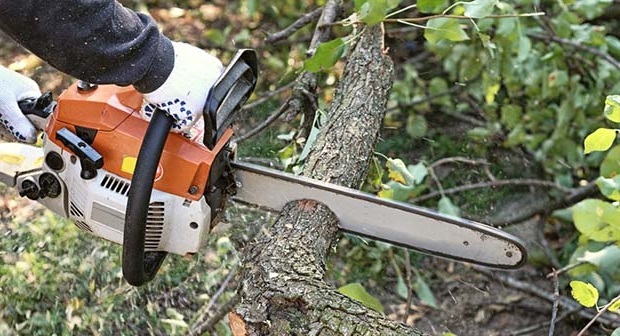 - there are some clear principles at play - be well positioned, use a good grip action and make sure your chainsaw is well sharpened and well oiled and the depth gauge cutters are properly filed down. Cutting with the upper portion of the tip could cause a kickback reaction, which can be bloody dangerous and may engage the chain brake. Basically, try to avoid cutting with the tip. It's good practice to cut at your waist level — never raise your saw above shoulder height. This is just asking for trouble if you run into trouble! You are less able to properly control the saw at this height and angle. Avoid cutting too close to the ground where the blade could dig in and kick back. Try to cut from the side of the saw. This is to say, do not stand 'over' the saw. A kickback in this position could be lethal as the saw will kick back into your line of sight - meaning a chest or face injury is on the cards. It's really easy to suddenly find yourself in this position if you have moved around a bit so keep an eye on your positioning at all times. You should cut with a downward pressure with the bottom of the bar — known as cutting with a pulling chain since the chain pulls the saw out from you. The vice versa applies when cutting upwards. We suggest you have a fair bit of practice with the standard method before trying an up cut motion. At the least, have a really good appreciation for how your saw feels in your hands. It is very easy to over work your back while using a chainsaw. Try not to curve your spine to move lower, instead bend your knees. Before using this heavy equipment you should get the safety training otherwise, it may cause harshness for you and other employees. Visit chainsaw safety training osha to more about the safety training courses.